For centuries, art has been used as a vehicle to inform the public, to illustrate a point of view, and to incite change. The introduction of printmaking, and later photography, played a significant role in politics due to the ease in which multiples could be produced and distributed to the general public. 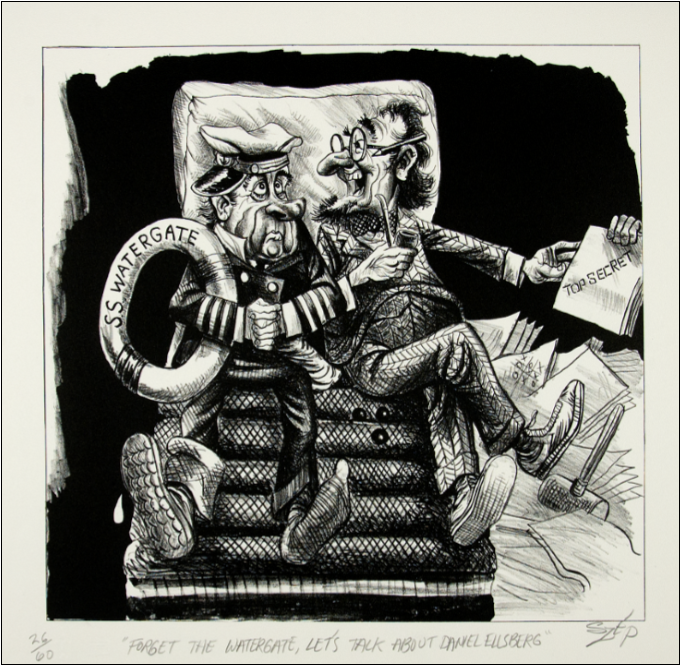 The new exhibit, Politics on Paper: Art with an Agenda from the Syracuse University Art Collection, examines the relationship between art and politics over time, using several examples of drawings, prints, and photos to advocate for a social purpose or cause. Pioneers of social commentary used the print process to create works on paper that illuminated the atrocities of war and tyranny. Jacques Callot (French, 1592-1635) is one of the earliest and most influential examples of an artist in this role. Trained as an engraver, Callot became well-known for his vast, multi-plate views of battles and battlefields. His most important work, Les Grandes Miseres de la Guerre (The Miseries of War) from 1633, would influence the artist’s role in society for centuries. Consisting of 18 small etchings, the series depicts the atrocities and warmongering observed firsthand from the Thirty Years War in Europe. The prints were small, portable, sharable, and exposed in realistic detail the day-to-day consequences of military affairs. Their bitter social commentary has inspired antiwar depictions ever since. 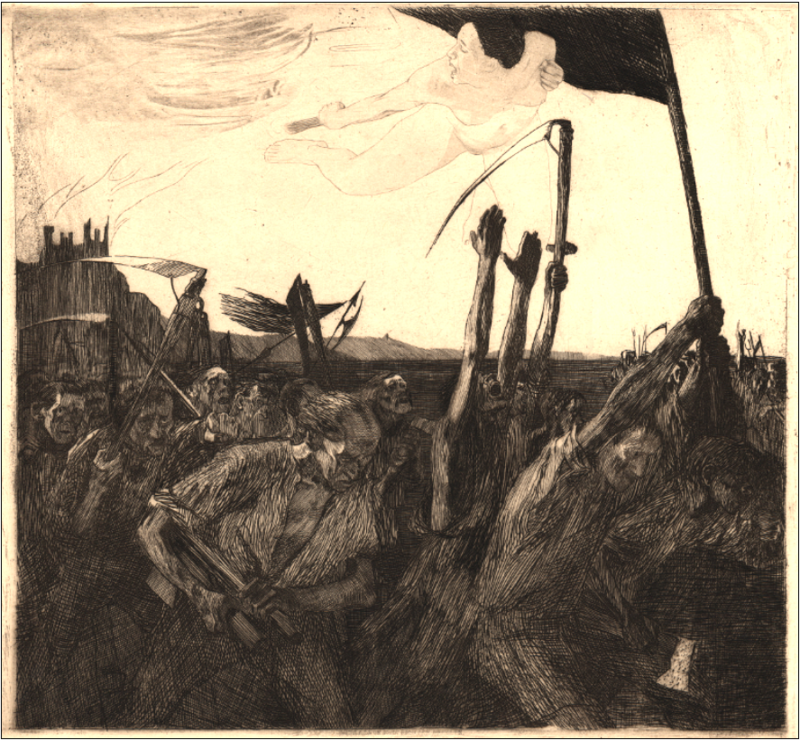 Francisco Goya’s Capricios (1799) and Disasters of War (1810-1820) series, Käthe Kollwitz’s depictions of the Peasants’ Revolt in post-World War I Germany, and William Gropper’s stand against McCarthy-era politics are all legacy to Callot’s gripping etchings. The 19th century saw the introduction of the industrial press that laid the foundation for the information age. Mass-produced periodicals, rich with illustrated texts, were now printed in the tens of thousands. 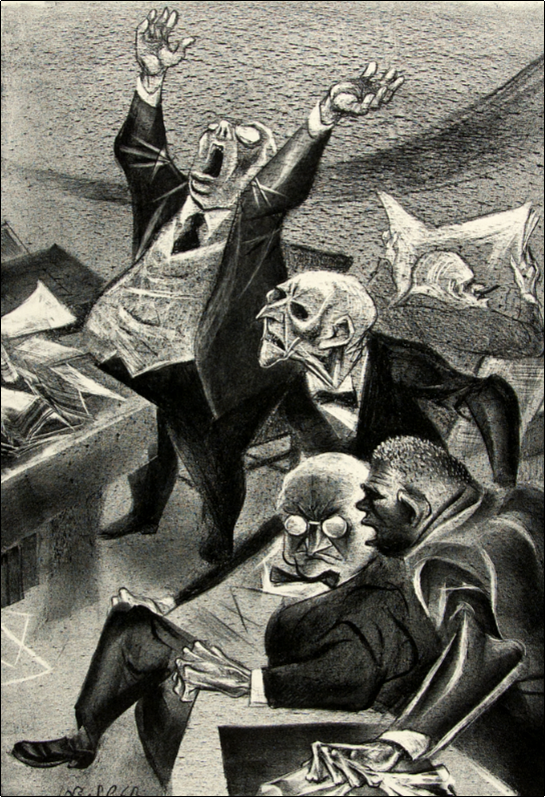 Artists such as Thomas Nast, Honoré Daumier, and John Pughe found great appeal in social cartooning and utilized the new pictorial press as the soapbox for their political cause. This spirit of social cartooning flourished into the 21st century and is evident in the work of Charles Martin, Paul Szep, and Barry Blitt. The past hundred years have been fertile ground for artists and satirists making artwork with social purpose. Between the two world wars, the Works Progress Administration championed artists who made work that instilled hope, gave purpose, and delivered a distinct nationalistic propaganda to a suffering nation. The political upheaval and radicalism of the 1960s saw innovation in how artwork was used and created. Photographic techniques mixed with traditional print processes introduced the art of appropriation, re-interpreting readily available images from the media, advertisements, and industry in a new context. Robert Rauschenberg, Andy Warhol, James Rosenquist, and Sister Mary Corita Kent are perfect examples. All used recognizable images from society to state an alternative point of view. Civil rights and race equality continue to be central themes to many African American artists, as seen in the work of Calvin Burnett, Elizabeth Catlett, and Kara Walker. Gender issues, economic reform, and war are all represented in the contemporary work of May Stevens, Amos Paul Kennedy Jr. and Enrique Chagoya. In a modern society where few issues are out of bounds, the art of the print remains one of the most effective instruments in the arsenal of art with motive today. Interested in learning more? Join Curator, Andrew Saluti, for an informal discussion on February 7, 6-8 pm. Group tours will also be offered every Friday by appoint between 10 am and 4 pm (last departure at 3 pm). The galleries are open Tuesdays-Thursdays, 11-8 and Fridays & Saturdays, 11-4. Admission is free. An insightful discussion of the exhibit with the Curator, Andrew Saluti. Thought Provoking tours with audience participation. Contact Robert Presnar to make your appointment. Meet and greet the candidates running for local office! Arts & Education at the Hoyt is hosting a reception for its latest exhibit, ”Politics on Paper: Art with an Agenda”, on Thursday, February 21, 6-8 pm. We’ve invited those seeking election in 2019 to join us in acknowledging the artist’s role in social commentary. This event is not a public forum or a debate but an opportunity to view the exhibit while talking one-on-one with those seeking office. Complimentary food and drink will be provided. RSVP requested. *If you are running for local office and would like to participate, please contact Executive Director Kimberly Koller-Jones.